Choosing the right venue is the first step in planning your day or even wedding weekend. If you are like me, choosing a location that is truly unique and “us” was the most important detail before we could get started with planning anything else. I always knew that I didn’t want to say “I do” in a big resort, a country club, or a ballroom. I live and breath unique venues, so it was only natural to plan my own wedding at an unconventional event space. Now that you have decided to choose an off the beaten path big day venue, there are quite a few things to consider and a few things you would have never thought of or had to encounter if you just chose a hotel. Is it worth the challenge? Absolutely! So, if you are choosing to say “I do” at an unconventional location, here are four weird things you need to consider that you probably didn’t think about. Wait, isn’t there an onsite coordinator, valet, and concierge? Probably not. More than likely there is no concierge, valet, bellboy, or any other helping hand you will find at the Four Seasons. 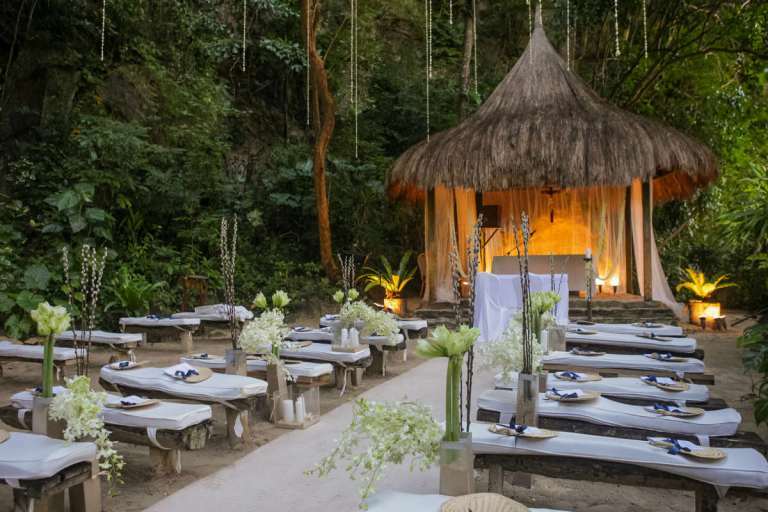 Whether you choose a luxury safari camp in Africa or an eco villa in Mexico, there probably has not been hundreds of weddings there so you need to be prepared to bring in professionals. Find out exactly what staff is provided onsite to assist with your big day or weekend. What services do they offer? If they have had weddings in the past, consider hiring the local experts that have produced a wedding or event at the property. If a vendor has already worked on the property, they will have an idea of what works and doesn’t work as far as flow and logistics go. Don’t forget to hire a planner. Whether a local coordinator or someone from your hometown, you’ll be happy that someone else is there to iron out the details. Utilities might not be included. Most unconventional event spaces probably were not built for events. A private estate for instance, will not have enough electricity to supply the needs for a large bridal party. In most cases, a generator will be necessary to supply enough power for lighting, entertainment, and kitchen equipment. You will probably have to bring in bathrooms and even in some cases, a water supply. Having to provide generators, lighting, bathrooms, building a kitchen, and water are just a few of the utilities that may not be included. These items can add up very fast so before booking that venue of your dreams, make sure to factor in all the extra utility costs that would be “included” in a hotel. Some spaces have limited resources. We chose to get married in Mexico’s wine country. Yes, Mexico has a wine country and it is as off the beaten path as it gets. We had to consider everything. There are no accessible taxis or grocery stores nearby. The closest ATM is about 30 minutes away and everyone does not accept credit cards. Being prepared is absolutely essential and making a list of everything you could possibly need and make sure it will be available and if not, make a plan to get it there. You also want to prepare your guests in advance if there are any limited resources. Could you imagine attending a destination wedding and showing up with no cash and having no convenient way to get any? Transporting your guests can be tricky. Whether it be a backyard “I dos” or a destination big day in the middle of the dessert, transportation can be one of the biggest logistical nightmares if you do not have a plan in place. A private estate will not have have a parking lot to accommodate tons of cars, so making arrangements to shuttle your guests is essential. If you are planning a destination wedding, are you going to provide transportation to and from the airport? Is the ceremony location different from where the guests are staying? How will they get there if there are no cars? While hiring one shuttle may be the most budget friendly, it may not always be the most guest friendly. Just because you want to party until the late hours, does not mean everyone else does. Be considerate and think about your guests overall experience. Jamie Whittaker is the co-founder of Venuelust, an online digital media company and luxury travel blog specializing in off the beaten path venues for celebrations, getaways, and experiences.